Our Centralized view baseline data tool empowers enterprises clients with actionable intelligence to optimize their network infrastructure for application deliver and network capacity planning. The high-level collected data provides information about the network switches, Firewalls, storage range, server, and other data center networking devices and network-related hardware. Conducted on your premises, Storage workshop helps our Network Architect and your IT team jointly review input from the phase one, determine the status of the data center infrastructure, and outline requirements, constraints, processes and future deployment strategies. In this phase, we analyze collected information and develop an initial draft of the Network Assessment report. The initial draft is created by the ITatOnce Network Architect team in conjunction with your IT employees. The intent of this report is to provide information specific to your network, and to draft recommendations on network restructuring and development in line with your demands. The ITatOnce Network Architect evaluates and incorporates the feedback from your IT team and continues to finalize the report. The final report consists of: Executive Summary, Customer Requirements Analysis, Assessment Findings, and New Network Architecture Proposal (incl. 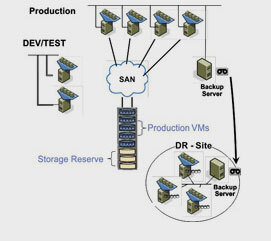 Switches, Firewalls and Storage Architecture Evolution), as well as Conclusions. Prior to presentation of the report, electronic copies of the report are sent to you for review, or handed out to your management on your premises.